I’m lactose intolerant, so I don’t typically eat ice cream. That does not stop me, however, from enjoying all the adorable ice cream paraphernalia that abounds in the crafting community. 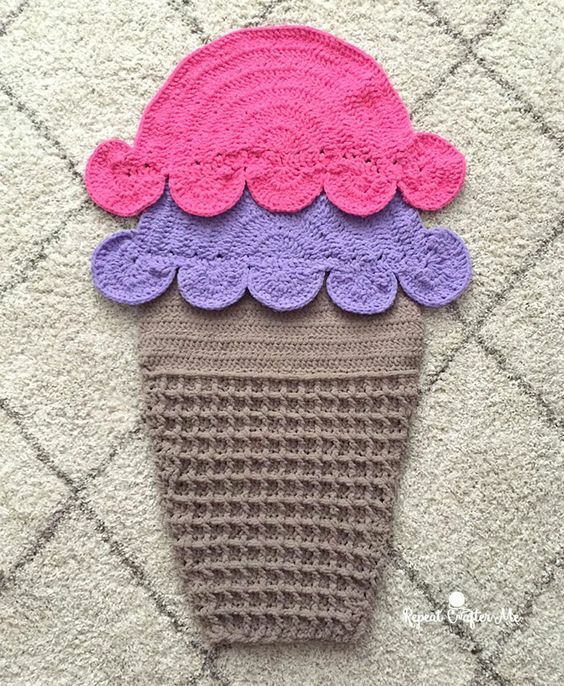 Recently I was looking for a blanket pattern and stumbled across the cutest blanket ever — the ice cream snuggle sack from Bernat. Bonus, it was a free pattern so I downloaded it and looked it over. While it is rated an “Intermediate pattern”, the only stitches you need to know are chain (ch), double crochet (dc), double crochet front post (dcfp), half double crochet (hdc), single crochet (sc), and slip stitch (sl st), which means that the stitches should be accessible to any level of crocheter. I think the reason it is labeled “Intermediate” is because it is such a huge project, and there are some tricky sections when switching colors for the ice creams. That being said, if you are a beginner looking for a new challenge, you might find this one enjoyable, and the payoff is at the end you have a snuggly, cozy ice cream blanket that everybody will be screaming about. You can make it whatever colors you want, whether you prefer a sugar cone, waffle cone, or dipped cone; whether you like strawberry and vanilla, chocolate and butter pecan, or mint chocolate chip. Get creative about which flavors and toppings you love and add them to show off your preferences. You can even put a cherry on top. You can also add accessories to make it more “3-D”, such as buttons, lace, rickrack, ribbon, or beads. The original pattern says it fits children 4-8, but it would also make a great lap blanket if you wanted to go that route. It would make a perfect gift for the ice cream and dessert lovers in your life, whether that’s a sibling, cousin, parent, or child. Of course, there’s nothing wrong with keeping it for yourself. 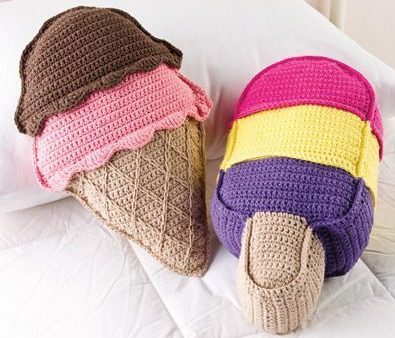 Take make one ice cream snuggle sack, you’ll need 16 skeins of yarn — 4 for the cone, and 6 each for the scoops. The pattern recommends using Bernat’s Baby Blanket yarn, along with a size “L” crochet hook and 3 stitch markers. You’ll also need a good pair of scissors and tapestry needle weave in the ends. Be sure and read through the pattern beforehand — when I make the mistake of glancing over it and thinking that I’ve got everything in order, that’s when I mess up. I now tend to read the pattern fully first, then make note of whatever stitches I need to brush up on, go watch a few videos, and then gather the materials I’ll need for the project. That way I don’t get aggravated, and slowing down means I’ll make fewer mistakes. Do you want more ice cream in your life without the brain freeze? Want to make someone’s naptime a bit sweeter? Then the Ice Cream Snuggle Sack might be just the thing. You can find the free pattern, along with some photos, on Bernat’s website. There are lots of free patterns there to inspire you and I recommend bookmarking the site or signing up for their newsletter if you want easy access to their library.